POP UP ART SHOP is a sales space featuring artwork for sale and artists to meet. Also, the newly retrofitted artist studios will be open! Please enter the Walk In Art Center by coming through the doors at 220 Parkway and take elevator to the 3rd floor. The record may not have been broken, but wishes are being granted! Click here to see a WBRE segment. The staff at Evans Network of Companies, friends and families are participating in Kickin’ For Wishes Festival TODAY! 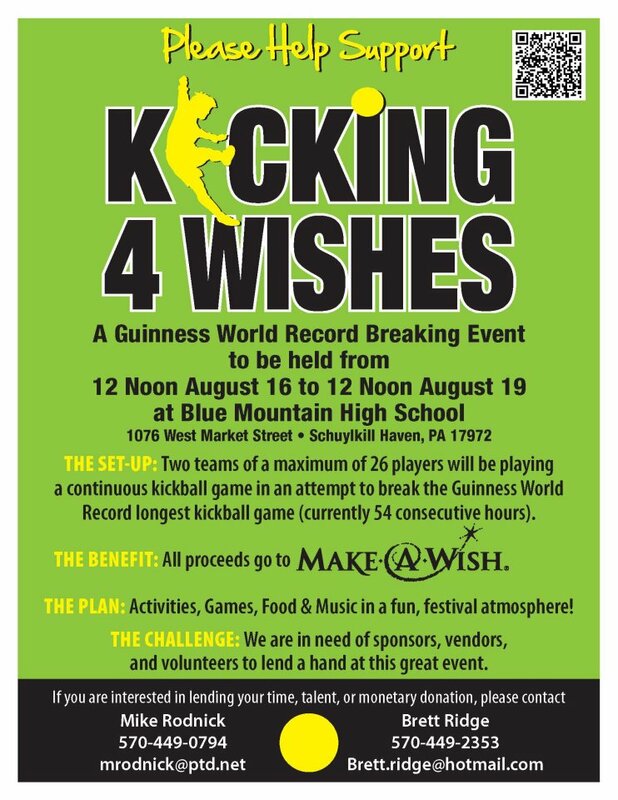 All proceeds raised during our venture to break the Guinness World Record longest kickball game (currently 54 consecutive hours) will be going to Make-A-Wish Foundation. Join us – cheer us on! We’re at the Blue Mountain High School, 1076 W Market St, Schuylkill Haven, Pennsylvania. You don’t have to play to help us raise money for Make-A-Wish. Other events such as auctions, kids activities, bake sales, and more will also be there! There will be something for everyone! Come out and support a great cause and cheer us on as we try to make history in Schuylkill County! There will be two teams of 26 players (total of 52 players) participating in the actual game. Here’s the poster with all the details – we begin at NOON today! You are currently browsing the Evans Delivery blog archives for August, 2012.